"Contours of Women Leadership in India". Thoughts on Education, A peer Reviewed Journal, Vol. IV., Sept. 2015., ISSN N. 2320-4710. "Dalit Entrepreneurship and inclusive Development". Thoughts on Education, A peer Reviewed Journal., Vol.IV, Oct. 2015., SSN No. 2320-4710. "Whither Reservation Policy?" International Journal of Management, Marketing and HRD., Vol.1., Jan, 2015., ISSN No. 2321-8622. "Education and Academic Development". International Journal of Psychology and Education., Vol.2., Issue 6., Feb, 2015., ISSN No. 2321-8606. "Problems and Strategies of ICT in Distance Education". International Journal of Educational aspects, Management Studies and applied Sciences., Vol.3., Issue 10,11., Feb, April, May, July 2015., ISSN No. 2320-0383. "Gandhian Philosophy in the field of Teacher Education". International Journal of Multi Disciplinary Sciences and Research. Vol.1., Issue 10,11., March, 2015., ISSN No. 2321-4872. "Gandhi's Concept of Piece Education and its Ethical Perspectives". International Journal of Multi Disciplinary Educational Research., Vol.4., Issue 4(2)., April, 2015., ISSN No. 2277-7881. "The Status of Girl Child in Gantyada Mondal of Vijayanagaram District, A.P". International Journal of Psychology and Education., Vol.2., Issue 8,9., April, May 2015., ISSN No. 2321-8606. "Child Labour in India". International Journal of Psychology and Education, Vol.2., Issue 10., June, 2015., ISSN No. 2321-8606. "Relationship between Teacher Efficacy and Teaching Competency among Secondary School Teachers". Educational Quest: International Journal of Education and Applied Social Sciences. Vol: V2,N4, P: 1-4., 2011., ISSN No. 0976-7258. Infrastructure and Academic Achievement of Secondary School Students. New Delhi: Sarup Book Publishers (P) Ltd. 4740/23, Ansari Road, Darya Ganj, New Delhi – 110002. 2016. ISBN: 978-93-5208-036-6. Positive Education. Visakhapatnam. Sucharita Publications, Door No. 8-21-4, Chinna Waltair, 2014. ISBN – 978-93-83729-59-3. Adjustment of Prospective Teachers. Discovery Publishing. House, New Delhi. 2011. ISBN-978-81-8356-724-4. Teaching material prepared for Teacher Education, B.Ed./M.Ed. to Dr. B. R. Ambedkar University, Hyderabad. Material prepared for Measurement and Evaluation to A.U. Visakhapatnam. Methods of Teaching English for B.Ed. programme to Nagarjuna Publishers, Guntur, A.P. Methods of Teaching for D.Ed. Programme to Nagarjuna Publishers, Guntur, A.P. 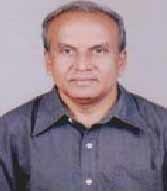 1 Mr. L. Rajesh Ph.D. Developing Oral Communication Skills of B.Tech Studyings using Audio-Visual Aids. 9 Ms. B.Santha Kumari M.Phil. 10 Mr. B.Rama Rao M.Phil. 11 Ms. Y.Siva Parvathi M.Phil. Adjustment in relation to Academic Achievement of 9th Class pupils in Vizianagaram district. 12 Ms. N.Anuradha M.Phil. Roles Stress of Secondary School Teachers. 13 Ms. V.Kameswari M.Phil. A Comparative Study of Professional Competency of High and Low effective class room practices among secondary level School Teachers of Visakhapatnam district. 4 Mr. R. Padma The Scholar needs modifications and corrections of mini draft proposal. 3 B.Ed. U.G. level Education in Emerging Indian Society, Contemporary India and Education, Knowledge and Curriculum, Gender, School and Society.